Spain is desperately trying to halt a drive for independence in Catalonia that threatens to derail its economy and plunge Europe into chaos. Catalan officials have warned they could declare independence from Spain within days after Madrid interfered in an independence referendum on Sunday. Violent clashes between Spanish police and voters have heightened tensions after the vote, which was deemed illegal by Madrid. Labor unions encouraged their members to join protests Tuesday that attracted an estimated 700,000 people. Investors are waking up to the risk: Spain's benchmark stock index dropped as much as 2.7% on Wednesday. Spanish banks with headquarters in Catalonia's capital, Barcelona, traded as much as 7% lower, and Spanish government bonds declined. Catalan President Carles Puigdemont raised the stakes further after the markets closed, launching a strongly worded attack on the King of Spain. Puigdemont said the Spanish monarch "ignores millions of Catalans who think in a different way." He repeated his offer to call in an international mediator. As politicians plot their next moves, businesses and investors are caught in the middle. Catalonia is Spain's most economically productive region, hosting 7,100 foreign companies including Volkswagen (VLKAY), Nissan (NSANF) and Cisco (CSCO). Many experts think that despite crumbling relations between officials in Barcelona and Madrid, the two sides will be able to negotiate a truce. 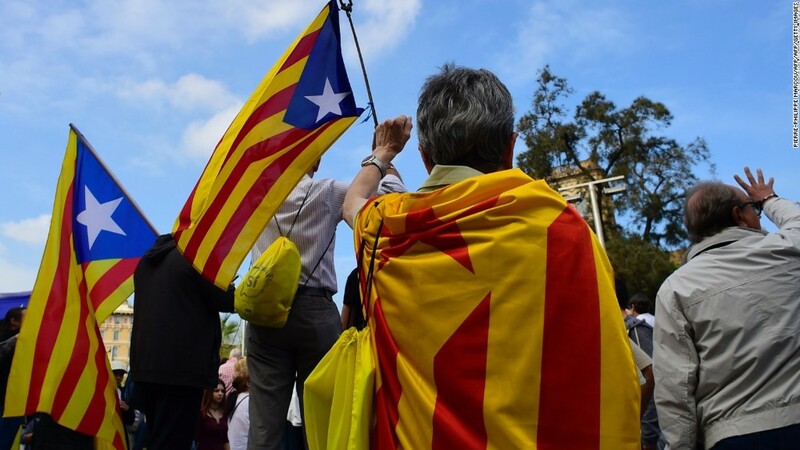 "Catalonia would not have the means, including the fiscal means, to enforce a full independence," said Holger Schmieding, chief economist at Berenberg Bank. "At some point in time, Barcelona and Madrid will need to talk." A negotiated settlement could leave Catalonia with more autonomy and increased control over its own finances. Even so, uncertainty and public unrest in the coming days (or months) could do a fair bit of damage to local businesses and the economy. Protests forced the closure of several highways on Tuesday, causing production delays at a Volkswagen-owned plant in the region. More disruptions would threaten worker attendance and productivity. Investments could also be delayed as corporate executives consider the implications of Catalan independence, said Stephen Brown, an economist at Capital Economics. Schmieding warned that a period of confusion could slow Spain's economic growth from its current 3.2% expansion to around 2.5%. The fallout could be much worse if both sides take a hard-line approach. If Catalonia were to declare independence, Spanish Prime Minister Mariano Rajoy might react by imposing direct rule on Catalonia, which currently maintains a degree of autonomy. This would likely result in more protests, violent clashes and labor unrest. Much remains unclear about what direct rule would mean for daily life but it would likely result in a "pretty significant amount of disruption," said Laurence Allan, director of country risk at IHS Markit. Local government operations in Catalonia could be slowed or halted, hurting businesses, he added. The tense situation could also lead to "boycotts against Catalan products in other parts of Spain," said Federico Santi, a European analyst at Eurasia Group. Experts said the most dangerous scenario for business would be an unsanctioned separation. Businesses in Catalonia would face the prospect of operating in a newly independent state with no formal trade agreements, a situation even more serious than Brexit, said Carsten Hesse, a European economist at Berenberg Bank. Catalonia accounts for nearly a fifth of Spain's economy, and it leads all regions in producing 25% of the country's exports. "It would affect the Spanish economy pretty significantly at a time when Spain has been recovering from its [economic] crisis," said Megan Greene, chief economist at Manulife Asset Management. In this scenario, investors could stop buying Catalan and Spanish debt and government financing costs would spike. Spain could go into a recession and risks could spread across Europe, said Greene. "This could bring back the eurozone crisis in a worst-case scenario," she said. The Catalan government offered a rosier picture, saying that it would do everything possible to help regional businesses. "We believe that in any of the scenarios that can be opened now, we can work to guarantee the correct business operation. There are many mechanisms which can guarantee the same characteristics and conditions of trade relations [as] now," said Joan Romero, head of Catalonia's trade and investment division. -- Emma Bowden and Claudia Rebaza contributed reporting.